The last time we reviewed new menu items for Tryst was in November 2016 when their new chef, Jon Robben, debuted a spectacular new line-up. You can see that write up here. Chef Jon is still cooking up fantastic new items and continues to lift Tryst's cuisine to a new level. Tryst is definitely known as a craft cocktail and night hot spot but sometimes gets overlooked for its food ingenuity. These new menu items will have you wanting for more. 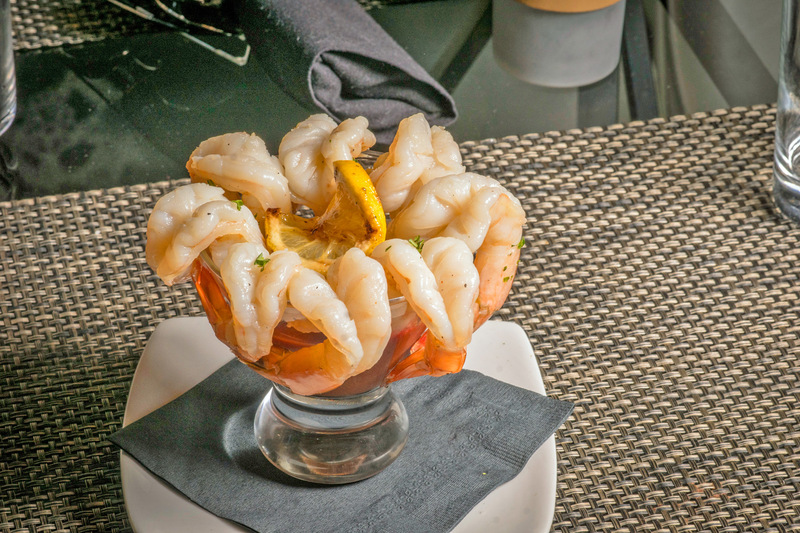 We get to have a few of these again on Tuesday, May 9th at our 2nd St. Petersburg Foodies SOLD OUT event at Tryst for National Foodies Day. Here are some of Tryst's new menu items for summer 2017. We started with the Tuna Poké which was very fresh with great flavors. This is the first time that I recall Tryst having a Poké on the menu. It is very light and refreshing for summer. Kevin and I both loved this dish. 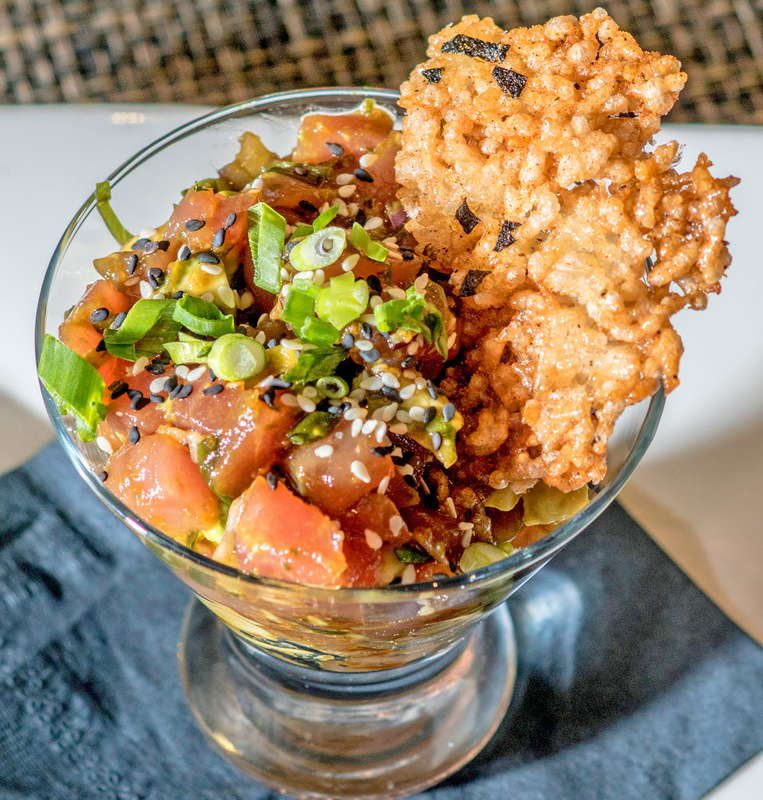 The Tuna Poké is served with puffed rice chips and spicy mayo. The puffed rice is actually sushi rice that is cooked until tender, slow dried over night and then popped in the fryer the next day. They were great tasting and gave the dish some crunchy texture. This is one of the items we will be having at our event. I was really looking forward to trying the Tryst “Cocktail” Shrimp - citrus poached shrimp with a smoked jalapeño, tomato and mezcal sauce. Chef Jon describes the sauce as "basically a cocktail sauce without the horseradish". The shrimp themselves were absolutely divine. Cooked perfectly and a very nice size. I was not a big fan myself of the sauce probably because I LOVE horseradish and I really missed it in the sauce. This sauce has a very different and smoky, chipotle like flavor to it, which I liked overall, but my feedback to chef was that I would probably love it if it had horseradish as well. Kevin really liked it very much and I know he will order this again. He also liked that the shrimp were butterflied. For me, it is too different without the horseradish. The next new menu item we tried were the Sautéed Mussels - smoked tomato sauce, fennel and country ham served with grilled sourdough bread. 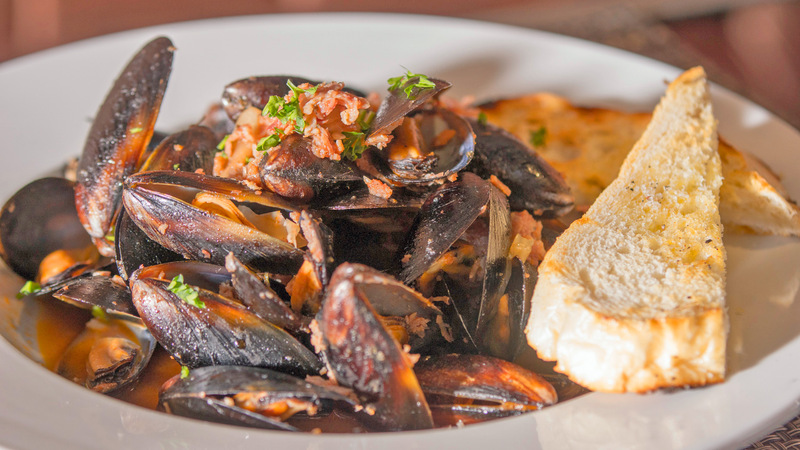 This dish is made with Prince Edward Island Mussels. This was not one of our favorites. The mussels tasted a bit fishy, which we did let Chef know about and I am sure that will change. I thought the sauce was good but could have used a bit more seasoning and flavor for me. Also, I am not a fennel fan so that didn't help in my opinion of this dish. There are apparently a lot of people who are, who will most likely love this one. 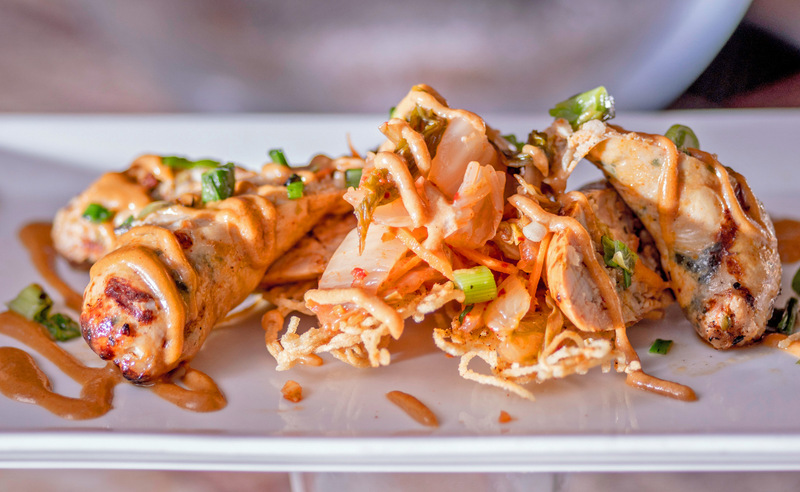 You won't find this next dish on any other menu - Chicken and Kimchi Sausage served with “bird’s nest” noodles and spicy peanut sauce. Chef Jon said that they could not find a place that made Kimchi the way he wanted it so they make it themselves in house. The sausage consists of the kimchi, ground up chicken thighs and bacon in a pork casing. The spicy peanut sauce is made with peanuts, coconut milk and ginger and this all sits on some crunchy, citrusy ramen noodles. I would say the spice was light to medium with great flavors! This is something totally different and I highly recommend it. Next up was the Prosciutto Flatbread - whipped Goat & Ricotta cheese, smoked tomato sauce, charred scallion, arugula and balsamic reduction. This was a good flatbread. 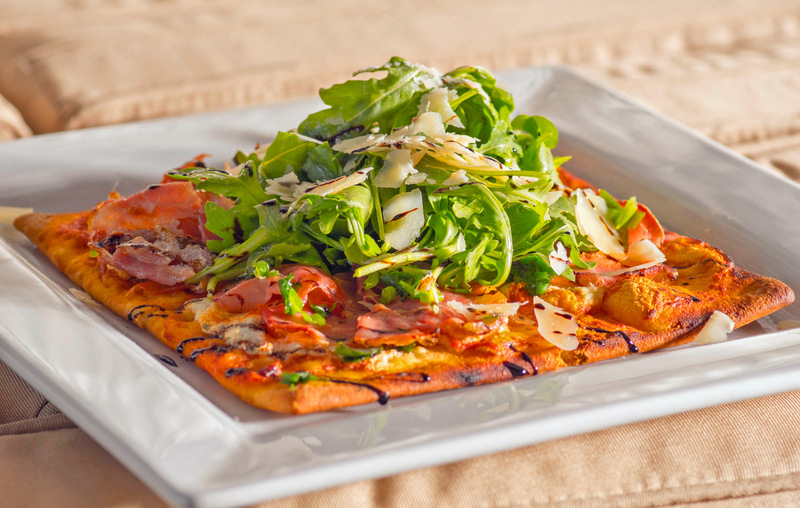 For myself, I don't really like a flatbread that is almost salad like, so I really don't care for the arugula but all of the other flavors were there. Luckily, it is pretty easy to solve the arugula issue. Just take it off or have them leave it off. 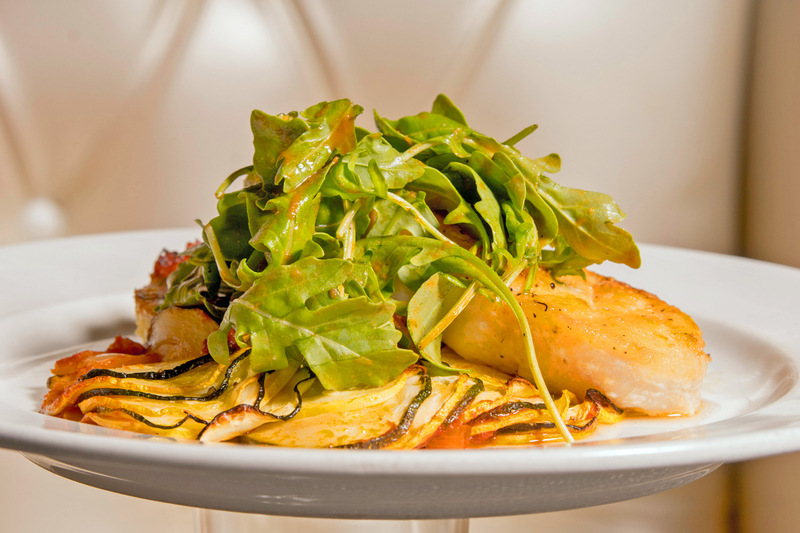 The Seared Gulf Grouper served with corn soufflé, roasted summer squash, arugula and tomato vinaigrette was the winner in my book! Wow! I did not expect so much flavor with this dish. The grouper was seared to perfection and delicious on the inside. The corn soufflé tasted like something that my Grandmother used to make. It was SOOO good! All around we loved this dish. 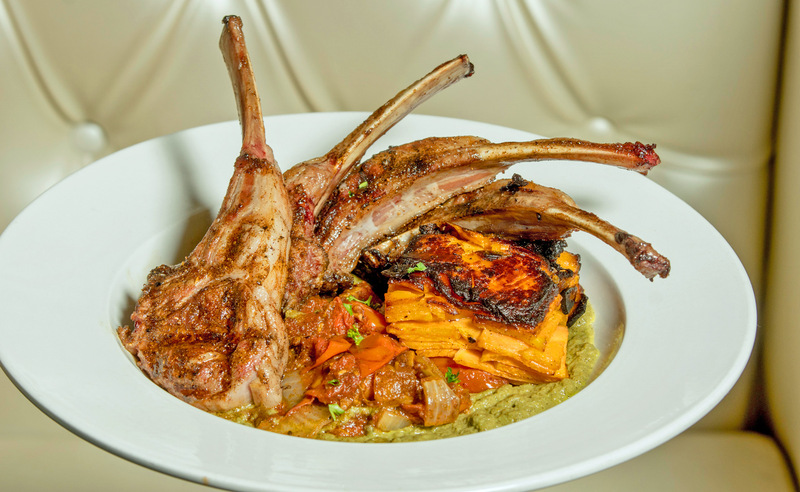 The Moroccan-Spiced Lamb Chops, with charred leek purée, roasted tomato chutney and sweet potato pave, is a dish I would normally lean towards on a menu - being the carnivore that I am and it looked amazing. I must say that the lamb was delicious. Not gamey at all. I thought the sweet potato pave was great too. However, and it wasn't mentioned on the menu, there is some fennel in one of the sauces that I detected right away. So unfortunately, I would have to order this dish without that sauce or not order it. Kevin loved it and it definitely elevates Tryst's entree list. 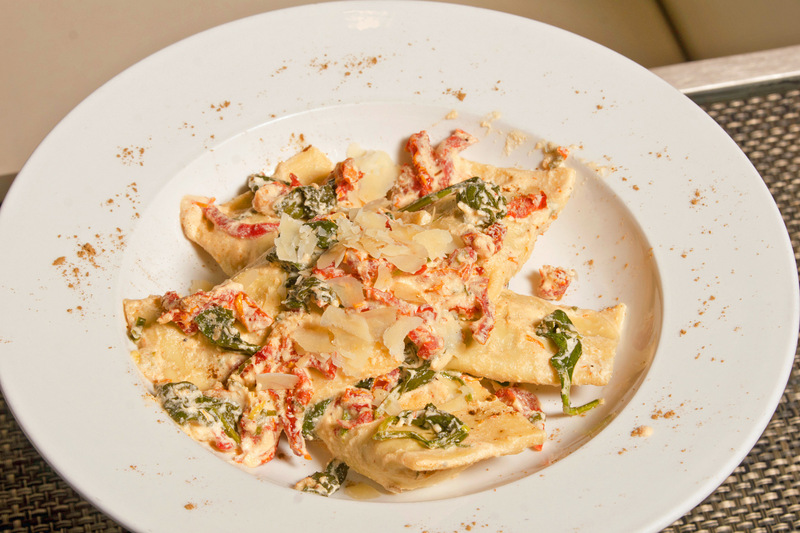 Those of you lucky enough to be going to our event will get to try this dish as well. This next dish was Kevin's favorite, I believe. 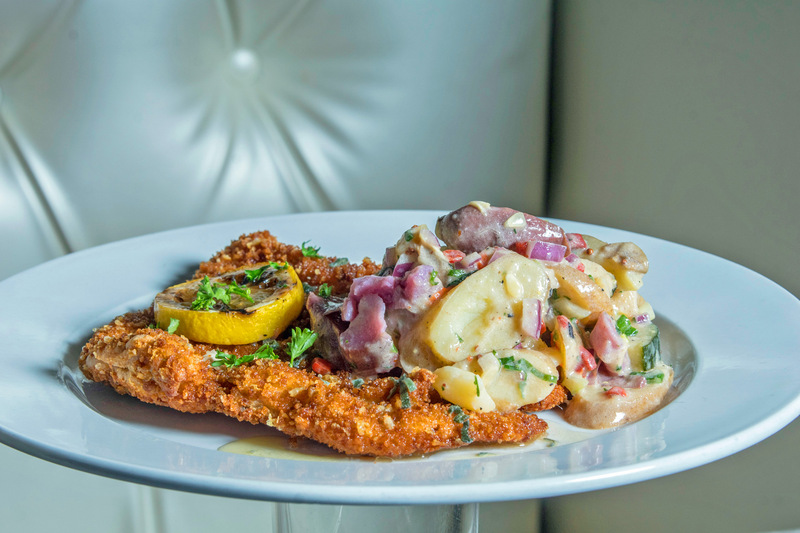 It was the Chicken Milanese (panko and parmesan crusted chicken) topped with a sage lemon butter sauce and served with a buttermilk, tarragon grilled zucchini and fingerling potato salad. The chicken is pounded thinly before it is coated. 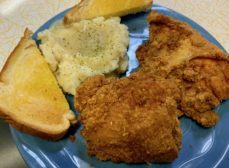 I loved the chicken and it's coating. It was very good! For me personally, I would prefer a warm side dish with it. But Kevin loved it all the way around. In fact, he ate the leftovers for breakfast on Sunday. 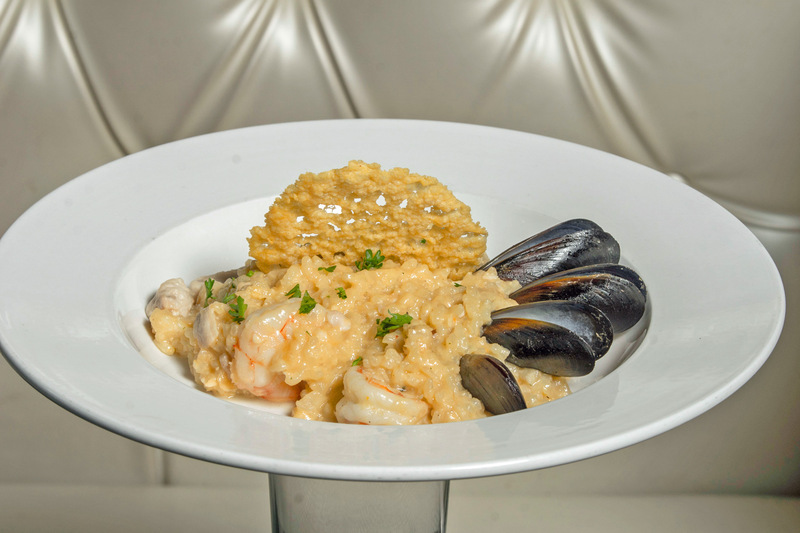 Doesn't the pan seared Seafood Risotto (shrimp, mussels, mahi-mahi and spanish saffron topped with a parmesan crisp) look absolutely decadent? Well all we can say that this picture doesn't say, is that the risotto, which is never easy to get right, was cooked perfectly! The rest speaks for itself! 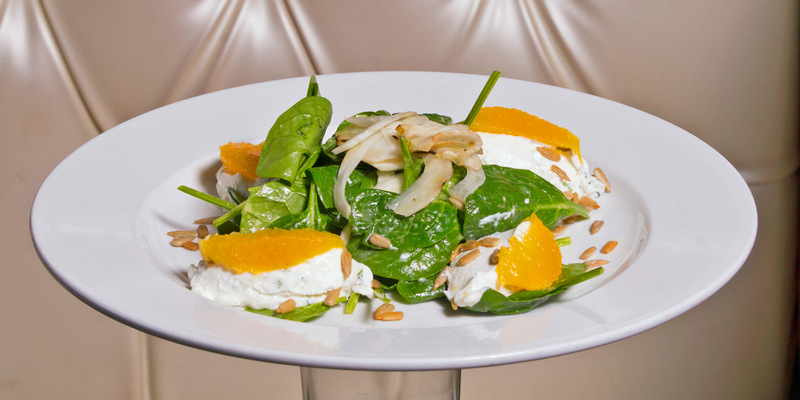 Next up is the Grilled Fennel Salad made fresh whipped goat and ricotta cheese, sunflower seeds and grilled spinach topped with a citrus orange vinaigrette. I only tried the cheese on this as to avoid the fennel but what an inventive summer salad for all of you fennel lovers out there! When we introduced the winter menu for Tryst in November, Chef Jon had added a Beet Salad that I fell in love with and helped me understand that I do actually like beets. For the summer menu, Chef is putting a new twist on the salad. 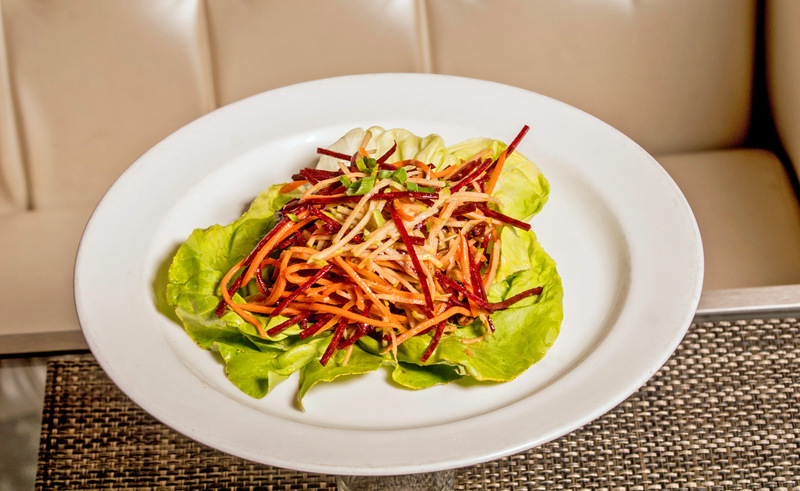 This Beet Salad is raw beets with apples and carrots mixed with a walnut vinegarette served on top of bibb lettuce. Very simple and it is absolutely refreshing and delicious! Fresh, crisp and bright flavors. I highly recommend it! 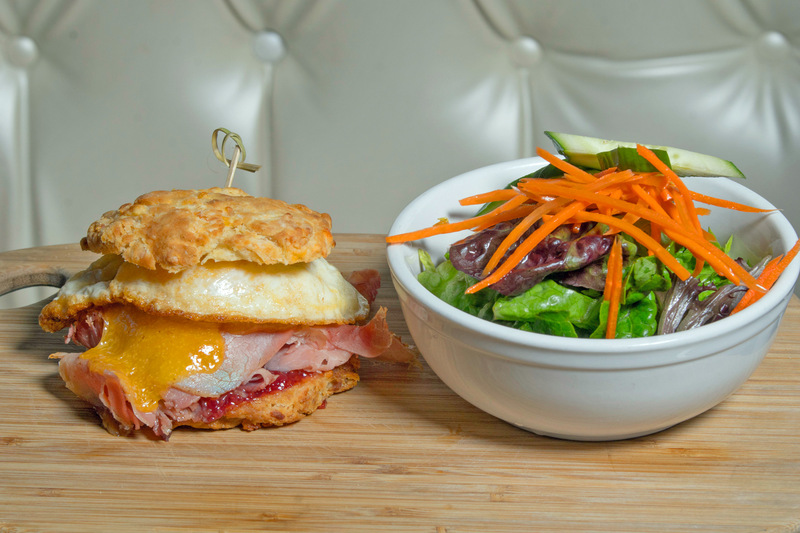 The last item we tasted was the Breakfast Brunch Biscuit Sandwich served with an over-easy egg, country ham, tillamook cheddar cheese and house jam with a choice of frites or side salad. This one is only on the brunch menu. To say that we were absolutely stuffed at this point, is an understatement. I only took one bite of this biscuit sandwich but it left me wanting more. 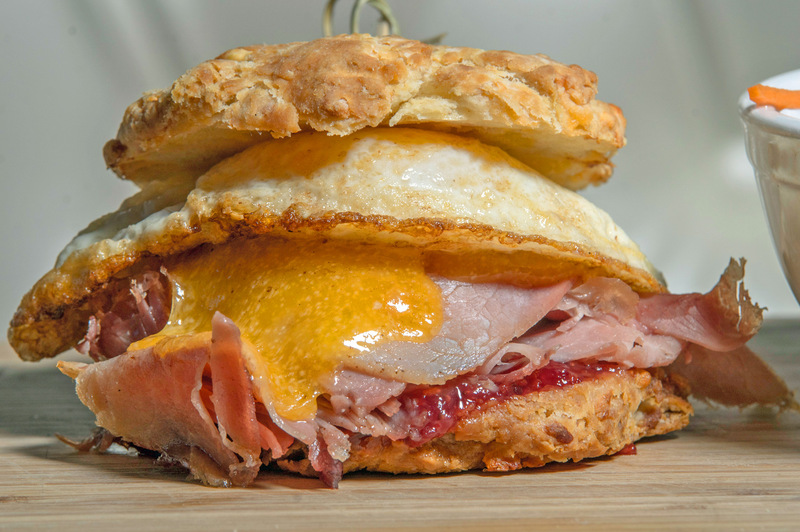 I love a good brunch sandwich and I think I will be going back for this very soon but with a side of fries in stead. Total brunch indulgence! 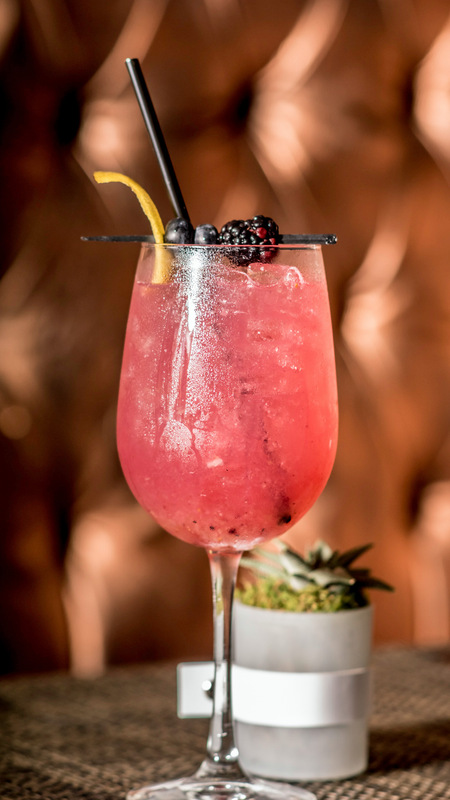 Mamoo Smash - a sinful summer smash of freshly muddled blackberries, blueberries, squeezed lemon, mixed with a heavy hand of ciroc mango and ciroc peach, shaken and served in a wine glass over ice. 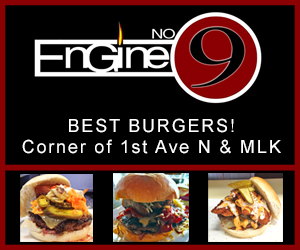 A St Petersburg Foodies favorite!! Georgia Old Fashioned - muddled peaches, orange bitters with Buffalo Trace bourbon, topped with a dirty cherry. 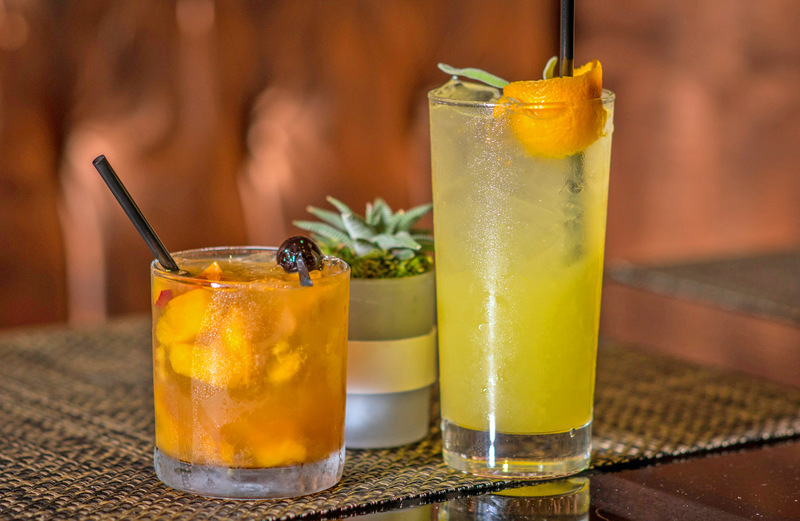 Citrus Blossom - Muddled lemon, orange and sage with Tito's vodka, lemon juice, and simple syrup, topped with sprite and club soda. Kevin loved the old fashioned, for me it was a bit bitter. The Citrus Blossom is bright, light and springy and I finished that one off and would definitely order again. Hmmm...maybe tonight! 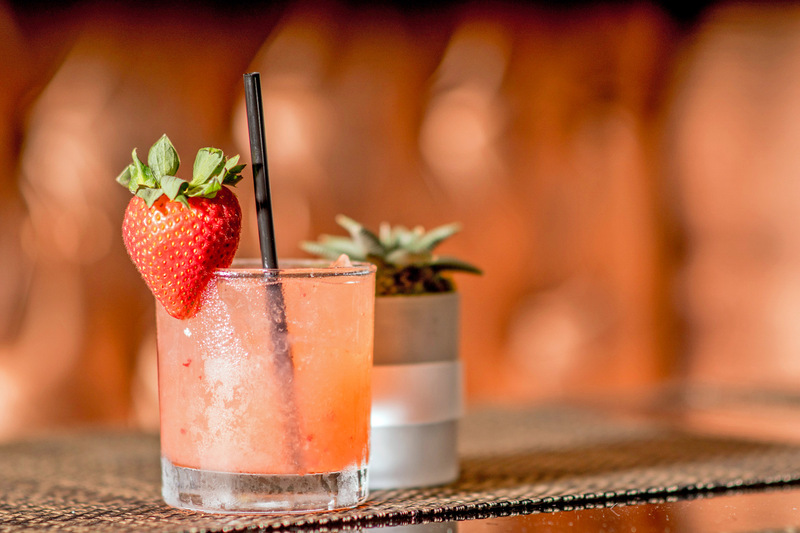 Spice Over Ice - muddled cucumbers, jalapeño and strawberries combined with don julio simple syrup and lime. Another favorite of us both, if you like a bit of heat, the jalapeño does just that and it is not too sweet. Done extremely well! 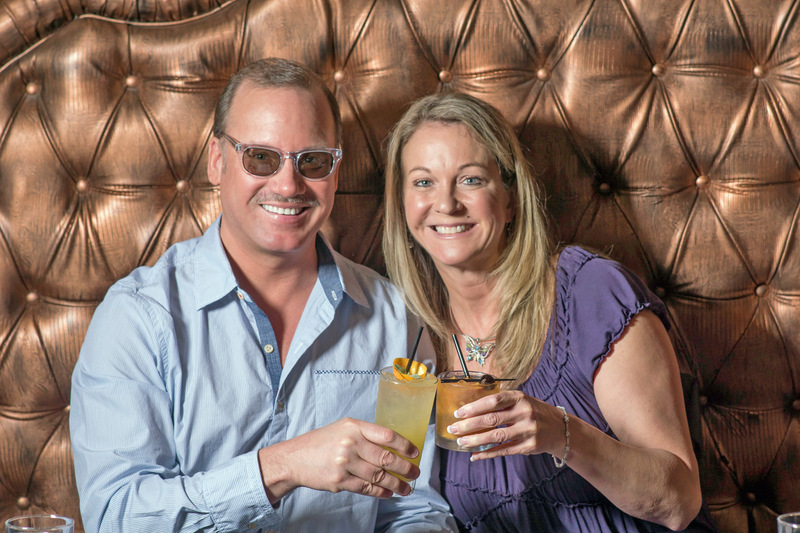 Tryst updates their menu to change with the season. Here is the latest new menu for Summer 2017 with some excellent new items and old favorites.